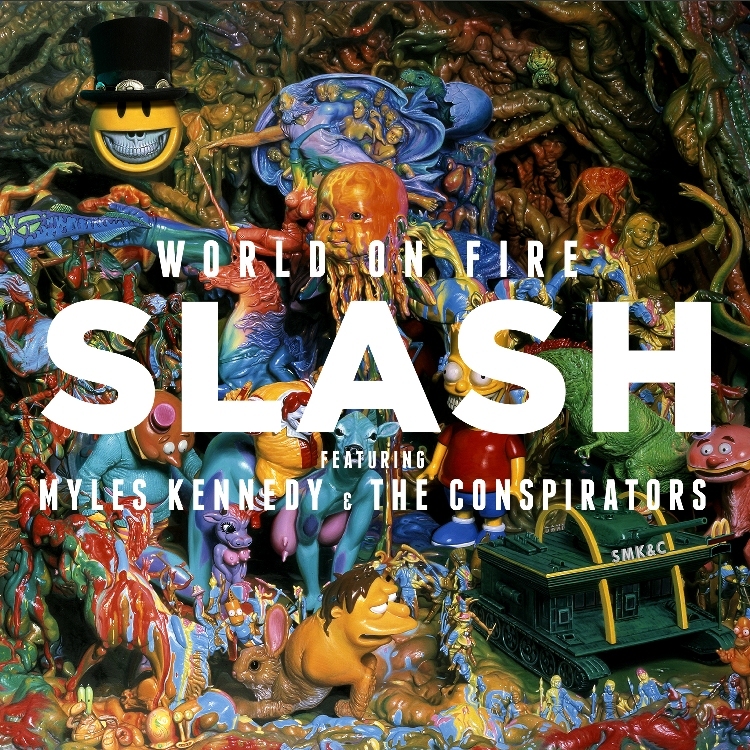 SLASH and his bandmates Myles Kennedy and The Conspirators will release their new album WORLD ON FIRE on September 16 via SLASH’s own label Dik Hayd International distributed through Caroline. The group revealed the cover artwork for WORLD ON FIRE designed by American contemporary artist Ron English today. Featuring the blazing title track as the first single—arriving at radioFriday, June 13th—the disc marks SLASH’s third solo album and second one with his band featuring MYLES KENNEDY (vocals), BRENT FITZ (drums) and TODD KERNS (bass). **See a Q&A with SLASH and MYLES KENNEDY below. Check out the exclusive behind-the-scenes documentary SLASH’s “Real To Reel” at: www.slashonline.com. The innovative online series documentedthe entire in-studio recording process from the first day of recording to the last; the multi-segment fly-on-the wall series follows Slash and The Conspirators from pre-production at NRG Studios in Los Angeles to Studio Barbarossa in Florida, as they write, play, create and record WORLD ON FIRE from start to finish. MYLES: Over the last four years we have definitely evolved into a band. Utilizing Todd&apos;s vocal prowess and Brent&apos;s ability as a multi-instrumentalist definitely highlights what the Conspirators are capable of. I feel like it adds to what Slash and I do as songwriters. Not to mention they are both a big part of the arrangement process. Todd even brought in a cool progression that we used for the verses in “Shadow Life” and he added an great intro to “The Dissident” which is really fun. MYLES: We didn&apos;t spend as much time fine-tuning arrangements as a unit during the Apocalyptic sessions. I think that’s part of the reason this record sounds as cohesive as it does. Slash spent a lot of time with Todd and Brent working on arrangements while I was on tour with Alter Bridge late last year. When I got off the road, I met up with them in LA so they could get a feel for how the songs felt with vocals. Another difference is that Slash played all the guitars on WORLD ON FIRE. During the Apocalyptic sessions I sang and played guitar which was fun, but it definitely cut into the amount of time I had to focus on lyrics, etc. Not playing guitar on WORLD ON FIRE gave me additional time to fine-tune lyrics and melodies which improved the songs in the end. I&apos;m very happy with how it turned out. MYLES: Elvis is brilliant. It&apos;s the fifth record I have had the pleasure of recording with him. His ability to get the best out of a rock band is pretty special. He always seems to be aware of what the fans want to hear from an artist. He did a great job documenting Slash&apos;s tone and sound. I remember the first time I heard the solo for “Battleground”--I was blown away. Elvis captured the sonic hallmarks that made Slash&apos;s playing resonate with me 25 years ago. MYLES: That would be a question for Elvis or Slash. I can definitely hear some new approaches that I haven&apos;t heard on the last two records. MYLES: It&apos;s got a certain intensity and drive that made it a compelling choice for the lead-off track. MYLES: “World On Fire” isn&apos;t necessarily a profound statement about where we are as a planet. It&apos;s about living life to the fullest....carpe diem. Some might perceive the track as carnal in nature, but the idea of seizing the moment and doing what makes you happy is the overall theme. Then again, it&apos;s not up to me to dictate what a song will mean to everyone. All I can do is tell you what was going through my head as the lyrics were being written. MYLES: Though rock is not the force that it once was in America, it still has a loyal fan base that always seems to continue regardless of what popular culture deems as the "cool thing." It&apos;s great because you go to a rock show and you know folks aren&apos;t there because they are following trends, they aren&apos;t fair weather fans, they’re following their heart and listening to music that they love. People have been saying rock is dead for years but the reality is that it just falls out of favor with pop culture from time to time. The rock fans are still out there and that&apos;s why a tour like this is so important.